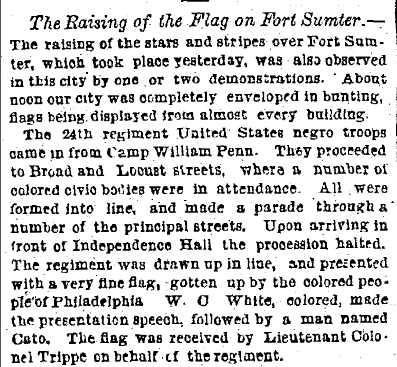 On April 14, 1865, the city celebrated the raising of the American flag over Fort Sumter with demonstrations as well as decorations. The 24th regiment of United States Colored Troops left Camp William Penn and proceeded to Broad and Locust Streets, halting at Independence Hall where they were presented with a flag. Octavius Catto and Jacob C. White spoke, and Lieutenant Colonel Trippe accepted the flag on behalf of the regiment. “City Intelligence,” The Philadelphia Inquirer, April 15, 1865. Dubin and Biddle, Tasting Freedom, 320-321. 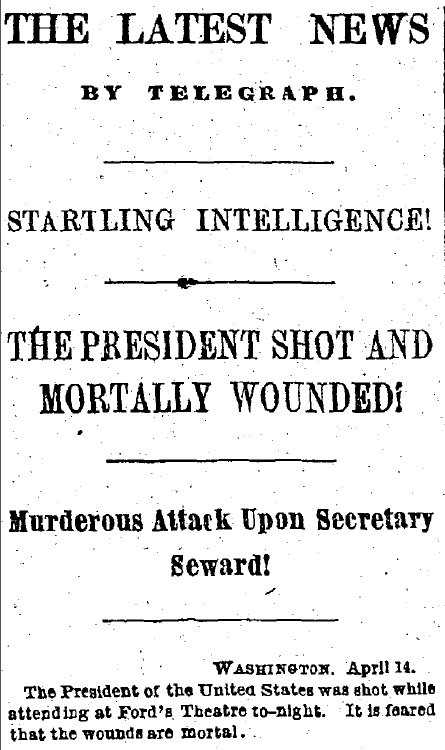 Headlines such as these alerted citizens to the imminent death of the president on April 15, 1865. On April 14, 1865 President Lincoln was shot by John Wilkes Booth while attending the play “Our American Cousin” at Ford’s Theater in Washington, D.C. His murder was announced in Philadelphia on April 15, 1865. Lincoln was succeeded by his Vice President, Andrew Johnson. 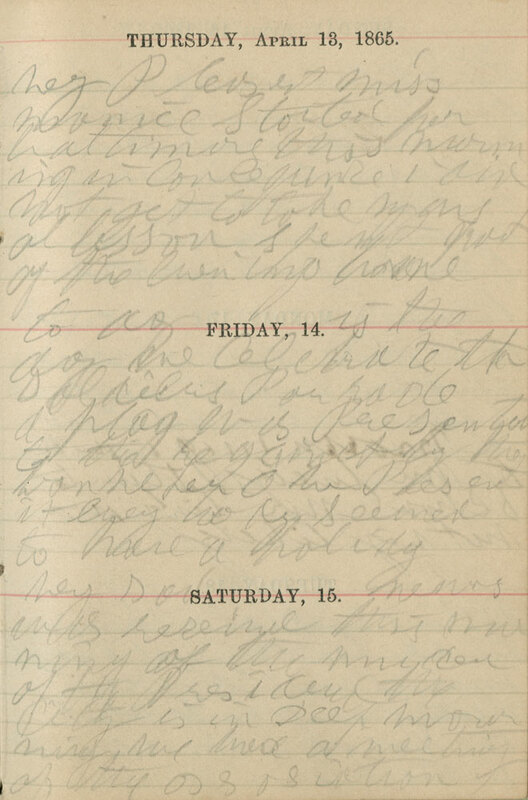 Emilie elaborates on this event in her miscellaneous pages at the end of the year. To view these entries, click here. In the Ladies Union Association Annual Report, Emilie’s name appears as a member of a committee organized to collect and distribute clothing collected for Freedmen in Charleston, South Carolina. A “Mrs. Elijah Davis” served the association as treasurer at the time of the annual report. The annual report for 1867 includes a letter of thanks from “J.C. Gibbs,” likely the former pastor of Emilie’s church, acknowledging with gratitude the receipt of $250 dollars worth of clothing sent in April 1866. The report included a letter of thanks from General Benjamin F. Butler for the gift of a “handsome black velvet dressing gown, cap, and slippers,” a LUA gift likely intended to recognize the Massachusetts’ congressman’s support for black civil rights. Report of the Ladies Union Association of Philadelphia, (Philadelphia: G.T. Stockdale, Printer, 1867), HSP. Giesberg, Army at Home, 107-109.